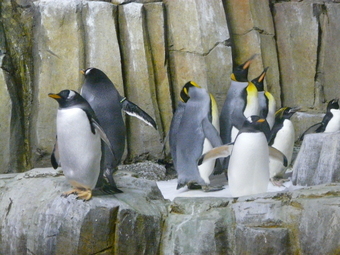 Penguins are marine birds who can't fly but are excellent swimmers. Actually they fly underwater. They live on different places on the southern hemisphere where it is very cold. Their feathers and fat keeps them warm to survive in such cold temperatures (their feet have special blood vessels so that they can stand on cold ice for long times). Those cold waters are full of fish and krill that they eat. On land grown-up penguins have hardly any enemies but inside the water they need to be careful of seals (mostly leopard seals), some sharks and killers whales that like to eat penguins. Within a species all penguins look alike to us. Scientists think that they distinguish one another by the sounds they make. 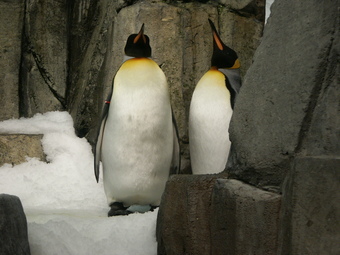 Their ears don't have external flaps and are therefore barely visible but penguins have excellent hearing. 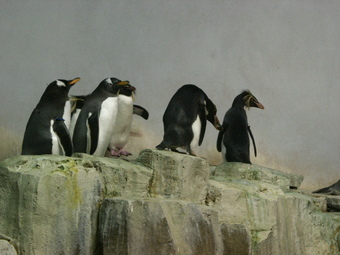 Penguins are said to be very social birds who like to be in groups. 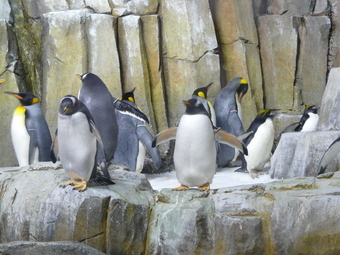 To nest and molt they gather in big colonies with many many other penguins. Usually the penguin mama and the penguin papa raise their offspring together. 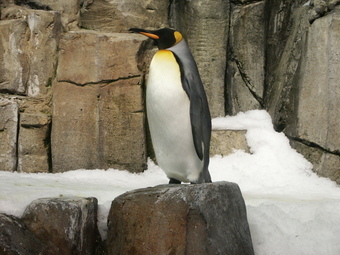 There are many different species of penguins with the emporor and the king penguins being the most famous and also the largest penguins of them. Another now famous species is the gentoo penguin that is not only a well-known, very good and free Linux distribution but also a penguin species that is easily recognizable by the white bonnet on their heads. The three photos that you see below were taken in the Biodôme in Montréal in October 2003.